The effective use of research and evidence can play a crucial role in making policy more successful. While policymakers in low- and middle-income countries often lack the capacity to effectively access, appraise and apply research when making decisions, capacity is just one element of a tapestry of factors that block or disincentivise evidence-informed policymaking. Click here to see a summary of the results. This was the headline finding from Itad’s three-year realist evaluation of the Building Capacity to Use Research Evidence Programme (BCURE), a £15.7 million initiative funded by the UK Department for International Development (DFID) from 2013-2017. 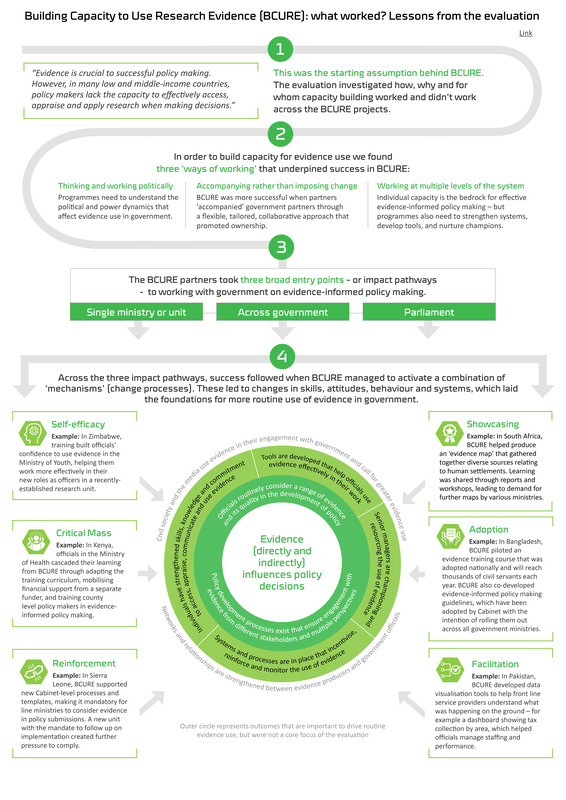 BCURE aimed to increase the capacity of policymakers to use research more effectively, through building the skills, incentives and systems required to access, appraise and apply evidence in decision making. We found that, across all the BCURE contexts, there was a genuine need to build technical skills in evidence access, appraisal and use. However, while there is a problem when civil servants don’t understand statistics or how to weigh up which evidence sources are reliable, fixing these problems won’t help improve policy if there is no political space to bring evidence into decision making, and no incentives for senior decision makers to care about evidence. You can find all our reports and findings below. For more information on the evaluation, click here. For more information on the project, visit the BCURE website. Literature Review: How can capacity development promote evidence-informed policy making? The literature review examines how and why different approaches to capacity building for evidence-informed policy making work, for whom, and in which contexts. Section 1 – What is ‘building capacity for evidence-informed policy making’? Section 2 – What factors promote and constrain evidence-informed policy making? 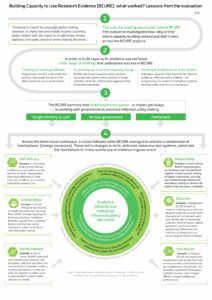 Section 3 – What is the evidence on how to build capacity for evidence-informed policy making? Read the Literature Review Briefing Note for an overview of three of the main lessons. You can also explore the BCURE Literature Database, which includes information on all the resources used, as well as other useful resources which didn’t make it into the review. Stage 1 Synthesis Report Briefing Note – Why don’t decision makers use evidence, and what can be done about it? The first year of the BCURE Evaluation provides the basis for the CDI Practice Paper ‘Reflections from a Realist Evaluation in Progress: Scaling Ladders and Stitching Theory’.